Big Mike’s Long-Range 650mm-1300mm f/8 Telephoto Zoom Lens for Nikon D-series This Very best Advertising Can advertise out very quick ! will need to have solution, be sure to buy now avoiding dissatisfaction! *Discount simply for limited time period Acquire the item currently. The 2X Teleconverter doubles the power of your lens to 1000 mm. The 500mm telephoto lens f / 8.0 for T mount is an ultra telephoto lens that brings distant objects closer and is ideal for wildlife photography. It is also used for landscapes, urban landscapes, architecture, sports and celestial photography and multiple applications of general photography. The multiple coating processes of the lens provide uniform light transmission and minimize combustion to produce sharp, high-contrast images. A built-in rotating tripod collar provides vibration-free stability when used with a tripod or monopod. This lens requires a T-mount adapter to attach to the camera body but can be compatible with virtually all digital SLR movies or cameras. Enhanced optical design and multilayer lens elements deliver crisp, high-contrast images with minimal flare. 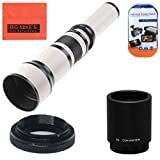 The Big Mike’s Long-Range 650mm-1300mm super-telephoto zoom lens for Nikon DSLR is a manual autofocus multi-coated T-mount lens that offers extreme magnification and can deliver excellent sharp images if used properly. Its white lens barrel reduces head buildup and it requires high ISO or bright light to utilize a fast shutter speed. For optimal results, use with monopod, tripod or chest supports to minimize camera shake. It has a 95mm thread and includes a tripod mount. It has a 95mm thread and includes a tripod mount, black lens pouch and a T-mount adapter for Nikon SLR cameras. We all Observed Cheapest Selling price with Big Mike’s Long-Range 650mm-1300mm f/8 Telephoto Zoom Lens for Nikon DseriesTestimonials by amazon.in. Quick in addition to No cost Shipment.Prior to deciding to obtain make sure you assess price tag on amazon.in yet again. Add to Trolley Nowadays though Investment Last to avoid Discontent.